Smartphones have just about made the MP3 player redundant, but not quite, because iriver has found a profitable niche for its premium brand, Astell & Kern, at the posh end of the portables market, where even the iPhone 5S is out of its depth. If you're going to cart around a separate device to play your music, it needs to be a good one, right? The Astell & Kern AK120 II exploits this logic with a perfected player (leagues apart from the old AK100) that uses hi-fi quality components and high-resolution audio compatibility to slay the smartphones in terms of sound quality and fend off hi-res rivals like the Sony Walkman NWZ-F886. So if you think paying over a grand for an MP3 player is unreasonable, here's why the AK120 II makes sense. 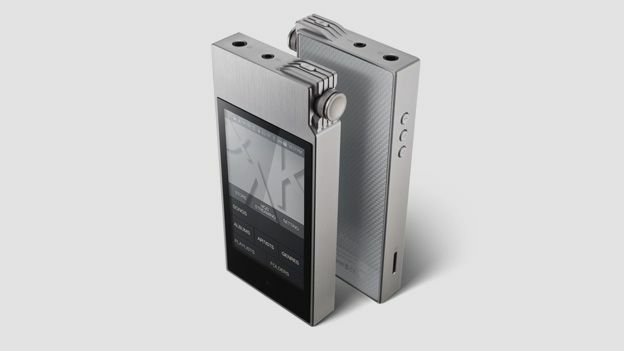 For starters, the Astell & Kern AK120 II looks and feels like an exclusive item. Brushed steel, glass and precision engineering inspire the same confidence as an expensive Swiss watch. At 55 x 118 x 15 mm, this is hi-fi that will fit in your pocket, but it's astonishingly heavy at 177g. Again, this is reassuring, so it looses no points for build quality. Whereas the Sony Walkman NWZ-F886 runs Android and all the features that come with that, including games, the AK120 II is strictly a music player, though it is also Android based. If you're chasing the edge of audio quality, then you should let your smartphone take care of Angry Birds. What this player can do that Sony's F886 and the outgoing AK120 cannot is play DSD files as well as all the other high-resolution file types up to 24bit/192kHz. This is crucial because the world of hi-res audio files is a confusing and often frustrating place at the best of times. Other features include 128GB of internal memory with a microSD card slot potentially adding a further 128GB. There are dual DACs (one for each channel), balanced audio output alongside the regular headphone out, wi-fi and Bluetooth. The AK120 II can also be used as a USB DAC to enhance the music on your Mac or PC and when the next free firmware update arrives, it will be able to stream your entire music library directly from your NAS drive too. The 3.3-inch OLED touchscreen displays your music with artwork and all the information an audiophile anorak needs to fully enjoy the music they're listening to, including the bitrate, file type and file size. The OLED touchscreen is also your intuitive and responsive interface with your music. It's Android-based, although it's unlike any phone. This feels and acts like a dedicated music player with all other functionality stripped away. Now that super smartphones like the Samsung Galaxy S5 and Samsung Galaxy Note 3 are able to play FLAC and WAV files at 24bit/192kHz, can a device with a slower processor really sound better? The answer is yes, demonstrably so, and the reason is down to the superior DACs and audio components. Smartphone brands source the cheapest, while iriver is uncompromising in this respect and the result is superior sound quality. Regular 320kbps tracks bought from iTunes sound noticeably clearer and more expressive than either our Galaxy S5, or iPhone 5S can manage. Wearing a pair of Sennheiser Momentum headphones and listening to Daft Punk's Get Lucky, the clarity of the treble and depth of bass both sound enhanced by the AK120 II. Switching up to a 24bit/192kHz FLAC recording of REM's Losing My Religion and the difference is more palpable. The iPhone 5S has already copped out at this point as Apple only recognises ALAC, not FLAC and the Samsung, after a faltering start, fails to express the extra audio info as an improvement in sound quality. Yes, there are high-resolution audio deniers who claim there's no audible difference between compressed and uncompressed music anyway, but they clearly haven't compared the two in a recording studio or on high-quality kit. The AK120 II thrives on high-resolution tracks, playing them without a pause and managing to convey the extra headroom in the frequency range as a more open sound. Michael Stipe's vocal seems to float centre stage with guitar strings twanging and scraping as if you're with him in the recording studio. Of course you'll need a decent pair of headphones to hear the difference and you won't find any in the box. We used Sennheiser Momentum and HD800 headphones to make use of both the regular minijack and the smaller balanced headphone jack. The balanced option has the advantage of being less influenced by external noise and has a louder output level, but your choice of compatible headphones is rather limited. Is £1,100 a sensible amount of money to spend on an MP3 player? Well, it's more cost-effective than a high-end hi-fi and can be found for half the price of Astell & Kernís flagship AK240 player. If you prefer to bathe your ears in high-resolution audio while all around you make do with compressed MP3s, then this beautifully designed and sonically superior product is worth the expense.